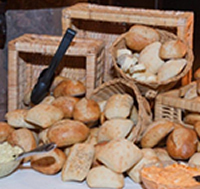 We offer a wide variety of Hors d'Oeuvres, desserts, beverages and custom menus. Please contact Encore Catering for further details and pricing. We provide complimentary disposable place settings for each guest, consisting of napkins, heavy-duty plastic cutlery and dinner plate. China and silverware are available upon request, call for current pricing.